Examples of lawsuits where the pain and suffering damage awards were found to be inadequate as a matter of law. One of the most frequently asked personal injury questions we hear in our office is about the amount of pain and suffering a victim can recover for their slip and fall. When answering that question, we consider the five Florida appellate court decisions below that ruled, as a matter of law, on the issue of whether or not a jury’s award of pain and suffering damages were inadequate. We believe these decisions give guidance for establishing a floor for these damages, which by their nature are hard to determine because of the difficulty of placing a monetary value on a victim’s past, present, and future pain. 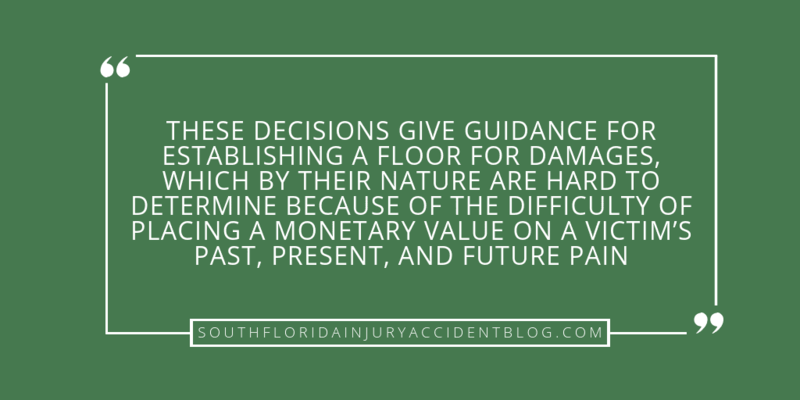 Nevertheless, the following cases should be evaluated by a slip and fall victim when considering their damage demands and evaluating their case in settlement negotiations, both before and during litigation. The test on whether or not a jury verdict is inadequate is if a jury of reasonable people could have returned that jury verdict. While shopping for groceries, Margaret West slipped and fell at the Food Fair Store. She hurt her back, forcing her to have two spinal surgeries. Neither of these back surgeries resolved her back injuries, and she was assessed with a 40% permanent disability. She sued the store owner under premises liability law for damages sustained in the slip and fall accident along with her husband, and the case went to a jury. Because Mrs. West had a congenital spine problem prior to the fall, the jury held her 50% responsible for the injuries. She appealed her jury award, arguing that the jury verdict was “so grossly inadequate as to shock the conscience of the court” and asked for a new trial on damages. The Florida appellate court found that the test to use in determining if a jury verdict is inadequate is to ask if a jury of reasonable men could have returned that verdict. Under the test, the appellate court was unable to find the verdict of the jury clearly and grossly inadequate and Mrs. West did not get a new trial on the damages award. When it is undisputed evidence that there will be continued pain and suffering as a result of an accident, a zero award for pain and suffering is inadequate as a matter of law. Eva Risley was leaving the Chart House restaurant here in Miami, when she slipped and fell on the walkway stones, fracturing her right hip. She was 82 years old at the time of the accident. Mrs. Risley was seriously hurt in the fall, having hip replacement surgery with 10 days hospitalization followed by 2 weeks of inpatient rehabilitation and therapy. After the hip surgery, Mrs. Risley regained her full hip function. The post-surgical pain in her hip went away. However, the fall injury had hurt her right knee as well, aggravating a pre-existing arthritic condition. She was forced to have knee replacement surgery, spending another several weeks in the hospital. Mrs. Risley claimed these damages from The Chart House, which denied liability. She filed a lawsuit and the case went before the jury. The jury awarded all of her medical expenses for both surgeries and hospitalizations. It also awarded her $5,000 to cover future medical expenses. However, there was no jury award for pain and suffering, disability, physical impairment, disfigurement, mental anguish, inconvenience, and loss of capacity for the enjoyment of life in the past and zero for the same damages in the future. Mrs. Risley appealed the jury verdict to the Florida appeals court arguing it was inadequate. The Florida appellate court found that since there was no dispute that Mrs. Risley underwent the two surgeries and spent significant time in the hospital; the jury award was grossly inadequate and unreasonable as a matter of law. An award that ignores proven pain and suffering damages is inadequate as a matter of law. Verna Stevens was doing her laundry when she slipped and fell at the laundromat. She was 65 years old at the time, and she broke her wrist in the fall. Medical bills totaled $600.00 for her broken wrist, and for a year after the accident, she complained of pain in her wrist. Mrs. Stevens sued the owner of the laundromat for damages under Florida premises liability law. There was no real dispute over her evidence of medical bills but the defense challenged her claim for pain and suffering damages. She provided expert testimony that her complaints were consistent with medical physical findings and the prognosis that she would not only have pain, but that she would suffer increasing pain in the future. Her expert gave her a 10% permanent disability as a result of her slip and fall wrist injury. At trial, the jury found the owner to be 100% at fault for the accident. The jury awarded Mrs. Stevens all her medical expenses but nothing for any other damage claim, including past, present, and future pain and suffering. The total jury award was $600.00. So, Mrs. Stevens appealed the award as inadequate damages. The appellate court agreed with her and sent the case back for a new trial. It held that when a jury awards the exact amount of medical expenses, despite indisputable evidence that the plaintiff suffered at least some pain from her injury, there has been an inadequate damage award as a matter of law. A shocking disparity between the actual medical expenses and the award for pain and suffering can be held as grossly inadequate as a matter of law. Benito Soto slipped and fell while shopping and shattered her left shoulder in the accident. Mrs. Soto was 59 years old at the time. She was in the hospital for two weeks following the fall, and needed two different surgeries to repair her shoulder injuries. Her doctor found that she suffered a 40% permanent loss of function in the shoulder because of how it was broken, as well as contributing factors of bone loss, rotator cuff tear, and calcification. This constituted a 20% permanent bodily disability according to her physician as well as the defendant’s medical expert. Because the store would not agree to settle the case, Mrs. Soto filed a premises liability lawsuit against the store owner. At trial, her disability percentages were placed into evidence as well as medical testimony that Mrs. Soto could not lift her left arm higher than 45 degrees and would experience continuing pain in her shoulder. Her prognosis included the possibility of another surgery to have a total shoulder replacement. The jury found that the store owner was 40% negligent and awarded $37,200 for past medical expenses, $15,000 for future medical expenses, and $5,000 for past pain and suffering, etc. The jury awarded $1000 awarded $5,000 for future intangibles and $1,000 for past loss of consortium and $1,000 for her husband’s future loss of consortium. The Florida appellate court ruled that these amounts were grossly inadequate given the evidence presented at trial. Specifically, $5,000 for past pain and suffering, etc., and $5,000 for future intangibles were found to be “shocking” in comparison to the medical expenses and inadequate as a matter of law. After all, Mrs. Soto had demonstrated that she had gone through two separate operations, and now suffered a permanent disability. So, Mrs. Soto was granted a new trial to assess damages. The court held that under the circumstances, all the damages should be retried unless the parties agree that the amounts awarded for past and future medical need not be retried. The total damage award for intangibles includes pain and suffering damages and can be grossly inadequate when compared to the actual medical expense damage amounts. While shopping for groceries, Maria Diaz, a sixty-one year old lady, slipped and fell at her Xtra Super Food Center. She hurt her back in the fall and presented a claim for damages which was disputed by the grocery store owner, forcing her to file a lawsuit. At trial, three doctors testified regarding her injuries. One was a board-certified orthopedist who examined her for the defense and testified that Mrs. Diaz had sustained a 50% compression fracture to a lumbar vertebra, which was a permanent injury that would cause pain throughout her life. Mrs. Diaz presented evidence of unpaid medical expenses of $3,200.00 and lost wages of $560.00. The jury verdict came back with a total damage award of $5,000.00. Mrs. Diaz appealed this jury verdict to the Florida appeals court, arguing that the jury verdict was inadequate in the damage total. The appellate court agreed. It held that the jury verdict allocated less than $1,300.00 for all her other damage items, including the intangibles. Given the evidence she admitted at trial, this was held to be grossly inadequate to compensate Mrs. Diaz for the permanent and serious injury she suffered. The case was sent back for a new trial solely on the right amount of damages Maria Diaz should be awarded. Even though many lawyers do not like doing so, an experienced Florida slip and fall injury lawyer should be able to, based upon their knowledge of the law and past experiences with juries, give an opinion on whether or not a pain and suffering settlement offer is fair. However, in giving that opinion the victim must know it is difficult to assess a victim’s future pain and suffering. A good lawyer should take the time to explain to a victim what the law says about these damages to avoid having the victim feel like they are being victimized all over again, this time by the insurance company and/or their lawyer. A good piece of advice if you or a loved one are injured in a slip and fall, is to speak with an experienced personal injury lawyer to learn about pain and suffering damages as well as the type of evidence needed to prove a claim and how most insurance companies respond to these claims. Most personal injury lawyers, like Alan Sackrin, will offer a free initial consultation (over the phone or in person, whichever you prefer) to answer your questions. You May Also Be Interested In: What Is Pain and Suffering Under Florida Law?